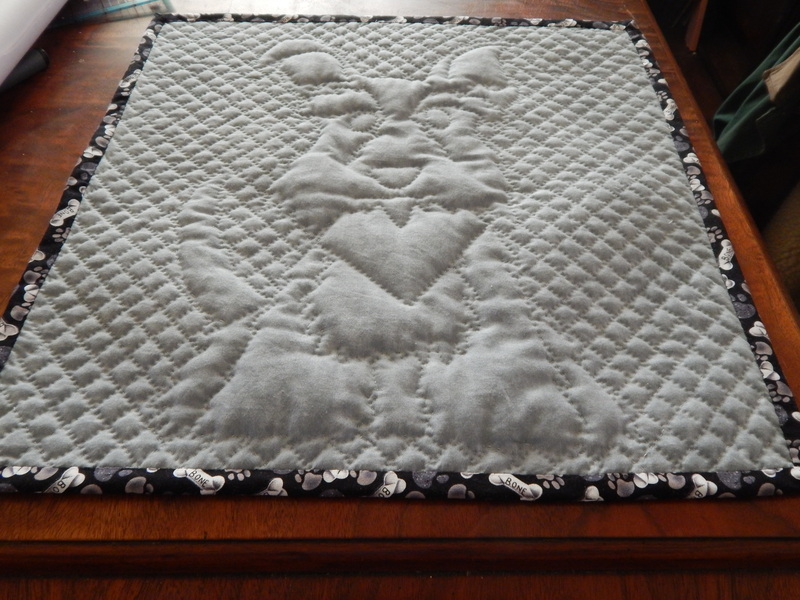 I finished the quilting on the Cartoon Teddy quilt for the Quilt Alliance contest. This is how I imagine Teddy would look if he were to be a cartoon character. I used a very thick poly batting to give him some definition, it shows better on the back. I am going to have to make another so I have one to keep because all entries become a donation to the Quilt Alliance, a 501(c)(3) nonprofit, and after a national exhibition tour, will be auctioned to benefit the mission of the organization. 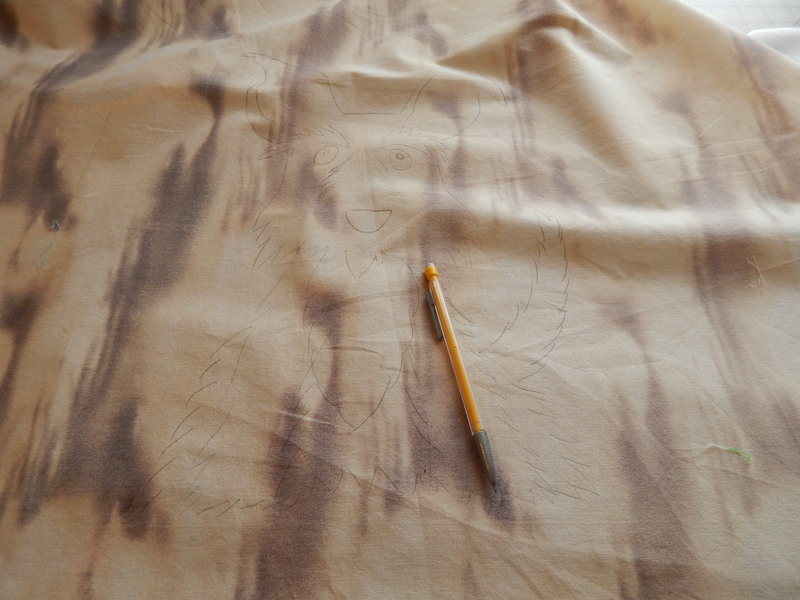 I did draw out another on a different fabric and I think I will finish that one to keep. Teddy almost always has a bandanna on, here he is yesterday. Last night it came untied and I didn’t notice it was missing until I looked at the pictures. 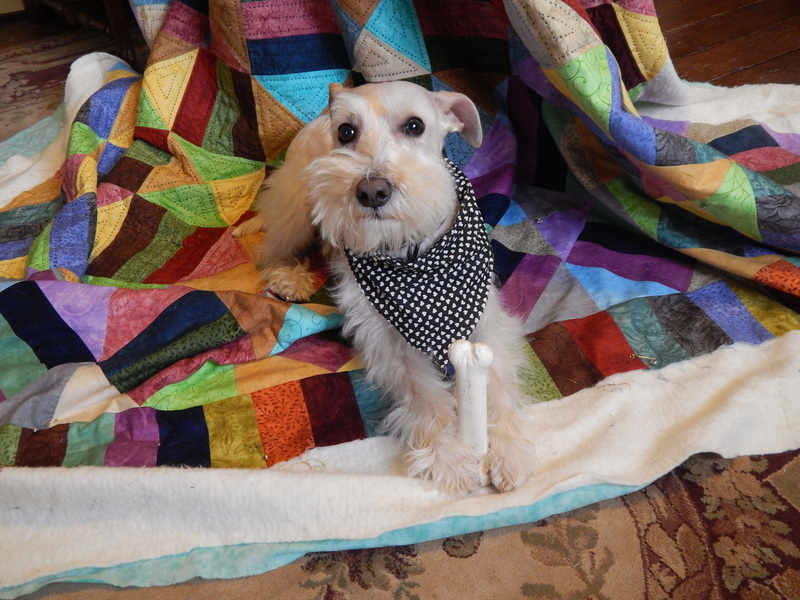 Here he is proudly posing with the finished quilt. He has his ears down in the picture, but often his ears are up, like in the quilt, when he is listening or thinking. I still need to add a hanging sleeve and label but that will wait until tomorrow . This entry was posted in Quilts and tagged hand quilting, Quilt Alliance, Teddy Quilt. Brilliant, as always! Just don’t let Teddy see you put that quilt in the mail! You 2 are quite the team! Nice work both of you. How I wish you weren’t so well known. This is going to be such a popular item I’m sure I won’t be able to afford it in the auction. 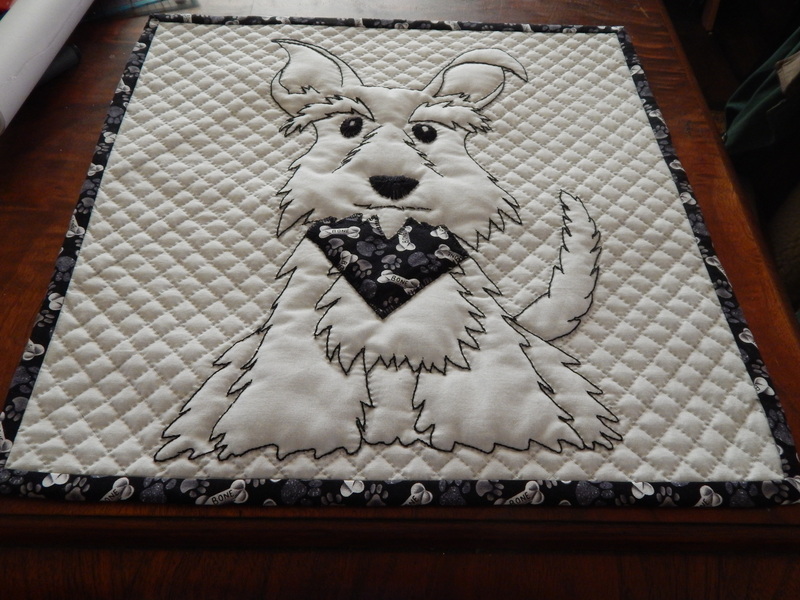 I just love Teddy and your quilting abilities are just amazing! In the first photo I can see Teddy thinking….do I really look like that? I look forward to seeing the second one too! Teddy is cute in the cartoon and in real life ! Love it when his ears are perked up. Great job !! Fantastique! Hi Teddy, you’re amazing too! Puppy LOVE! I think with one ear up and one ear down, Teddy is only half listening. I have been married almost 47 years. I know the look! The quilt is a work of art. I am admiration gob-smacked! 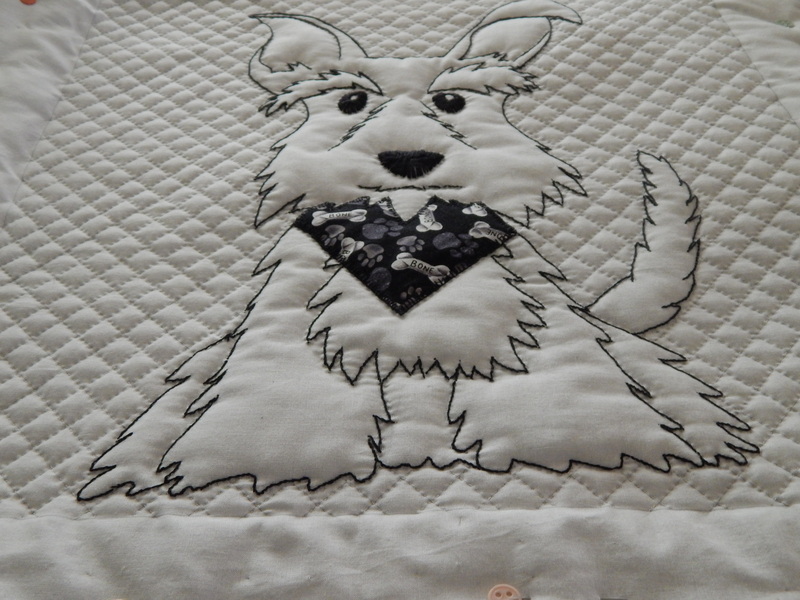 The quilting is perfect to make your cartoon Teddy pop out of the background. It’s a wonderful, cute piece of work, and just right for its intended use. What a wonderful quilt. The real live Teddy is probably one of the only things in the world cuter than Cartoon Teddy. You are so very talented and have developed such a high level of skill. Thank you for sharing your inspirational work so freely with us. This is just adorable! I almost love the back more than the front. Either side is just too cute! Exceptional on so many levels! You two are the most talented team! I so enjoy reading every post. Thanks for sharing. Love the bright GFG backdrop. This is just adorable! Good thing I’m reading this on my phone, otherwise my schnauzer would be getting jealous. Absolutely lovely, Tim! 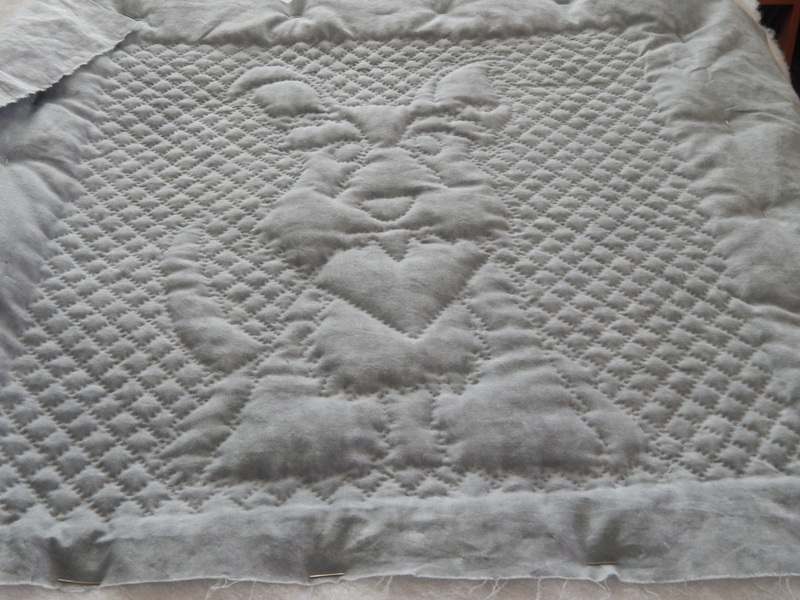 Teddy certainly looks dashing in the quilt, I am sure it will be a popular piece during the auction. Are you experiencing the deep freeze too? Brrrrr,,, better find another bandana for Teddy! Tim, that is such a cool Teddy quilt! Your talent never ceases to amaze me! I was so hoping you had enough bandana fabric for the binding! Your quilt, and the real Teddy look terrific. Your work just amazes me! How you get so much done in such a short amount of time. This quilt of Teddy is going to fetch a good sum of money. Please do let us know what it brings. For your initial drawing, did you do a line drawing from an enlarged photo, or did you draw the cartoon freehand? You really have captured the expressive face of the real Teddy. Too Cute! I like the diagonal quilting. Perfect! 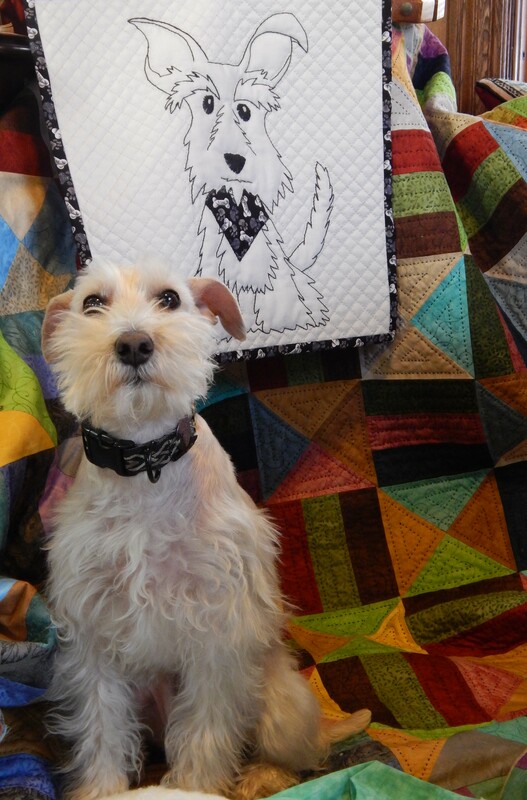 Hi is certainly a very cute dog and your cartoon quilt is fantastic! He is such a cutie. Great quilt! I think I will try a similar technique for my Eli, my white mini Schnauzer and focus just on his face. 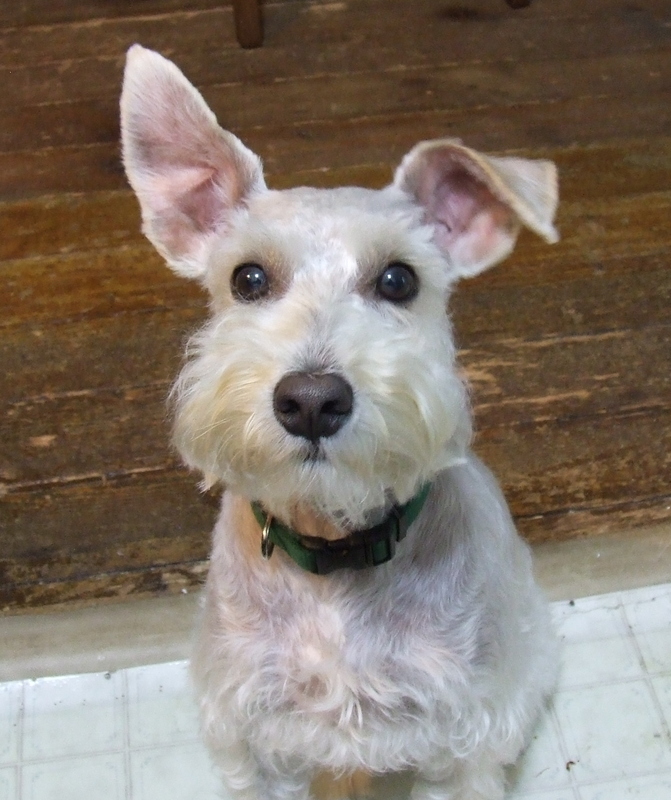 Did you see the news coverage of the white mini Schnauzer in Cedar Rapids, Iowa that tracked down her “mom” 15 blocks away in the hospital. Google it if you haven’t seen it. I do not live with any animals myself, but I know many who do and the love is remarkable. One friend, seeing any four legged walker, brings the auto to a screeching halt, leaps out, and converses with them. I see the same devotion to your Teddy. It leaps off the quilt and your blog. The quilt is a winner and I look forward to hearing what it garners in the auction. I was thinking about the version you will make for yourself and suggest that rather than applique one bandanna on you somehow adapt/engineer the design so that you can interchange bandannas as the seasons or groomer’s latest change. Small dots of velcro? A collar to thread through slits that then snaps or buttons? A few quick hand stitches? It would be so fun, and so Teddy to change it up on occasion. Love the way it turned out and the poly batting worked well! Love your quilt! And love a pet who poses! My dogs were acting as if being punished if I tried to pose them on a log or whatever. My attitude at that time may have been a problem. Another great job, Tim! I am always amazed at how fast you can finish a quilt. It would have taken me a week just to transfer the pattern! A very lovely tribute to Teddy! Do you think Teddy realises that the quilt is of him? I wish that I had a thimbleful of your productivity. Teddy is so lucky to own you! How I enjoy your work! Your quilt has inspired my imagination to see Teddy as a cartoon superhero fighting criminal squirrels, digging up buried secrets in the garden beds, and holding an inquisition where he licks the face of the perpetrator until the criminal comes forth with the truth. … but in my heart, Teddy will always be stalwartly posing beside one of your beautiful creations. Thank you for sharing Teddy with us. This is amazing and so is Teddy!! I have a Panzer, she looks just like Teddy. Aren’t these dogs amazing? I love, love, love your stitching.